It turns out that when one declares, in the middle of Hyde Park, “Sir, I insist that you immediately remove your shorts!” many people will start to stare. I felt the élan of my interjection had been reminiscent of Sir Laurence Olivier. Evidently, onlookers were not of the same mind. The air, which had been full of laughs and summer frivolities, was now still and silent. Those who were not looking in my direction in stoic disapproval where phlegmatically covering their children’s eyes. A tourist, whose command of the English language was subpar, was waiting for the translation from a worldly passer-by. When the translation came in, subtitles and all, he gave a shrug and started to remove his socks before being stopped. An orderly queue started to form. A few pictures were taken. I am not used to being the centre of attention. As a general rule, the Vasa nature is modest and reserved. I am not one to make a spectacle of myself. Anyone who knows me can attest to that. From my work as a conundrum consultant impeding the march of daylight groping uncles to my management of Girl Scout related incidents. All is calm discretion. Nevertheless, I found myself in a peculiar situation. I adopted a confident pose, rather like Nelson on top of that column at Trafalgar Square. I awaited the opening salvo from my fashion competitor. The declaration had a mixed effect. Unflappable Londoners, used to eccentricities, adopted a live and let live (or is it live and let die?) attitude. They moved on to more important things, like ice cream. The rest, not yet equipped with unflappability in the face of adversity, issued a muted gasp. One lady, evidently incapable of witnessing the strong emotions of the scene, fainted and fell backwards into the Serpentine. Our dialogue resumed as her family was pulling her out and embarking on first aid operations. Half the crowd felt that situation more promising and moved over to get a better view. “Sir, evidently, I wear these Lexington Redcoat red summer short shorts better than you. Since we cannot both wear them, you must abandon you pair. I suggest you burn them, to avoid further embarrassment.” I felt confident in my rebuttal. My nemesis of the day was not dissuaded. I exchanged a handshake with my new fashion nemesis in a way that unites all members of the Commonwealth. I was going to inform Beaconsfield-Outremont that my Uncle Edward’s fiercest competitor in the world of umbrella insurance happened to be based in Montreal. Alas, this was not a conversation based on pleasantries. Ypres finally arrived at the scene of the crime. The crowd had thinned-out quite a bit since someone had yelled, “Call an ambulance!” from the side of the fainted women. The muscular-thighed Montrealer stated that the shorts were in fact made for men and fitted his frame better than mine. I gave him a cold stare intended to remind him of the Canadian winter. Ypres, unperturbed as usual, began her investigation like a crab on a mission. Ypres issued a small nod and headed for the Serpentine. In the meantime, I explained to the Canadian that Ypres was my Lady’s assistant. The kind of person who helps me with the more tiresome things in life, such as bookkeeping, making travel arrangements, or peeling fruit. I was informing him of the importance of having one’s five a day, and that flavoured water does not count, when Ypres reappeared. She stood silently. In her hands there rested a water balloon filled to the point where a gentle tickle would have made it burst. Taciturn and composed, she lifted the balloon above her head. Then, in a manner that in my flashbacks I think of as approximating a bowler in a particularly challenging game of cricket, she struck. Ypres threw the water balloon with great force. A millisecond later I was drenched from head to toe. Summer Short Shorts: A Vasa and Ypres Adventure – Part III will be published Monday, 16 May 2016, at 12:00 EST (Westmount, Montreal) 17:00 GMT (Mayfair, London). 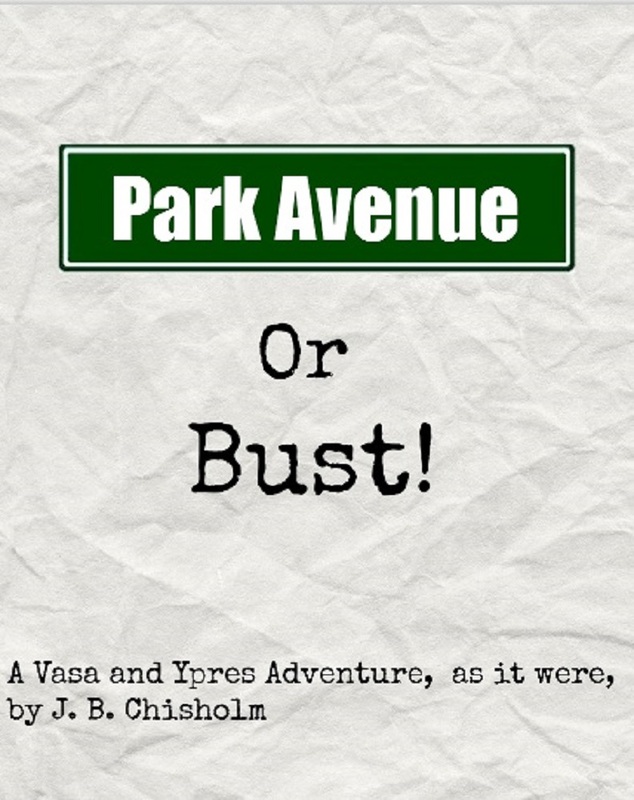 Vasa and Ypres’s first full length adventure, Vasa and Ypres: A Mayfair Conundrum, is available on Amazon. If you enjoy Vasa and Ypres, please share on social media. Vasa and Ypres is on Twitter. You can also join over 810 WordPress followers. Who could stop reading after that opening sentence? Heck, who could stop staring! Well done. This is amazing! You write beautifully, I absolutely adore this piece 🙂 Simply wonderful. Thanks a bunch! Your comment is much appreciated and gives me confidence to continue.